"(The Toddy) is the ultimate coffee maker." In 1964, as a chemical engineering graduate of Cornell, Todd Simpson developed and patented a cold brew system that, using regular Arabica coffee beans, creates a superior-tasting cup of steaming HOT coffee. And, with 67% LESS ACID than coffee made by conventional hot brew methods, it's easier on sensitive stomachs. 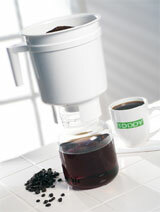 The Toddy brewer produces a low acid, espresso-like concentrate. Just add water for a distinctively fresh, smooth taste that has delighted connoisseurs for some 40 years. And, refrigerated, there's no waste – Toddy can be made one cup at a time. Toddy-made is also delicious served iced cold. Several of the world's leading coffeehouses use Toddy's cold brew process to make their best-selling iced coffee drinks.